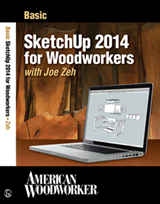 I am pleased to announce that American Woodworker and Chiefwoodworker have teamed to bring in-depth and quality SketchUp training to a greater audience of woodworkers. 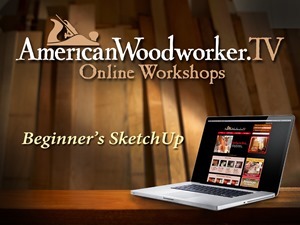 Beginning March 12, 2013 Chiefwoodworker’s Beginner’s SketchUp Tutorials and Intermediate SketchUp Tutorials will be available exclusively through AmericanWoodworkerTV. From the day I learned of Google SketchUp (now Trimble SketchUp) I became convinced it was a tool perfectly tailored for woodworkers. 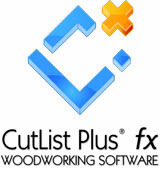 I have worked hard since 2007 to provide training to fellow woodworkers in the use of this tool. 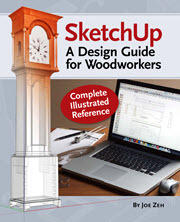 I have met a lot of woodworkers over the last six years and believe I succeeded in giving them the training they needed to add Trimble SketchUp to their woodworking toolbox. However, the reach of Chiefwoodworker’s Blog can’t compare to the audience American Woodworker enjoys. American Woodworker is dedicated to providing training to woodworkers in all areas of woodworking with quality videos hosted by knowledgeable and expert woodworkers. It is my hope and belief that reaching a much greater audience with my tutorials will provide a greater service to woodworkers everywhere. I am delighted and proud to team with American Woodworker to benefit my fellow woodworkers. Chiefwoodworker’s Blog will continue to provide posts, newsletters and videos on woodworking and SketchUp and I will continue to support my fellow woodworkers with SketchUp assistance when asked. In addition, I will continue to develop and provide SketchUp plugins. I also expect that my relationship with American Woodworker will grow. So stay tuned to my website (srww.com, Chiefwoodworker’s Blog, Chiefwoodworker’s Newsletter and look for me on AmericanWoodworker.tv. American Woodworker Magazine, AmericanWoodworker.com, AmericanWoodworker.TV and Woodwork Magazine are all properties of New Track Media LLC.